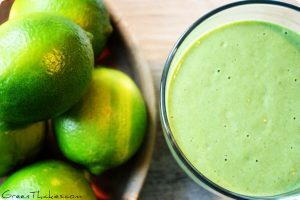 I’ve only recently discovered this healthy key lime pie smoothie and judging by the amount of times I’ve already made it I think it’s going to be an all time favourite. There’s something about lime in smoothies. I don’t know what it is but I just adore it. It gives every smoothie an added zing and freshness. No wonder a lot of my favourite smoothies contain lime. 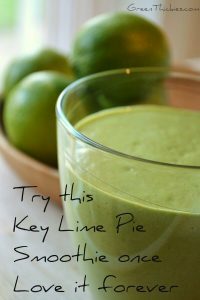 So what could be better than an actual lime smoothie, and even better a healthy key lime pie smoothie. I loved this smoothie so much I already featured it as one of my Top 10 Green Smoothie recipes, but I just had to turn it into a green thickie. Why turn green smoothies into green thickies? Wasn’t it good enough already I hear you ask? Yes it was just perfect but I drank this smoothie along with 4 other green smoothies on the morning I made it and it just didn’t fill me up at all. There’s nothing wrong with drinking green smoothies as snacks if you have the time to make them, but I don’t have time for snacking so that’s why my green smoothies have to be my meals. To make a green smoothie into a filling meal, I normally add oats to my them. Of course everybody needs a different number of calories to fill them up and we are all different on different days, some days we are hungrier, so feel free to adjust this smoothie accordingly. The beauty of green thickies are that you can simply add less oats (and a little less water) if you want less calories or more oats (plus a little bit more water) if you want a more filling drink. It won’t affect the taste at all as oats have such a neutral taste anyway. Whatever you do, don’t drink green thickies alongside your normal meals unless you actually want to put on weight or do a lot of exercise. 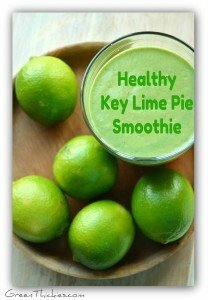 I’ve only recently discovered this healthy key lime pie smoothie and I’ve already lost track of the number of times I’ve made it. An all time favourite. 2 Bananas (Fresh or frozen. If frozen you might need to add more water) If you can’t eat bananas, this would work with mango too or just more oats. Juice and zest of 2 -4 Limes. It tastes amazing with 4 limes but it’s still nice with just 2 limes. 1 Cup Spinach, tightly packed or 2 cups loosely packed (or any other mild greens) OR if you run out of fresh greens, add 2 scoops of Amazing Green Powder for an extra healthy green boost. This Green Thickie serves 2 so you should DRINK HALF OF THIS RECIPE. But if you have higher calorie requirements you may need to drink more. You can find the original recipe here at Healthful pursuits. Leanne’s blog is well worth checking out as her recipes are gorgeous and her photos will make you drool. Your version sounds delicious and so filling! YUM! Yes it’s gorgeous isn’t it. It’s a shame we can’t get hold of key limes here though so I’ve never tasted one but normal limes are gorgeous in this smoothie. I’ve also got your key lime pie on my list of recipes to try. It looks so gorgeous. I often end up making the smoothie version of a food before the actual food. Yes I really need to have filling smoothies as I just don’t get the time for my porridge anymore. 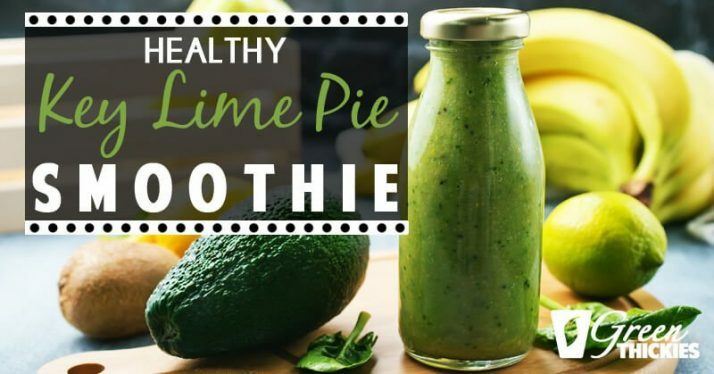 Ha ha, yes I’ve yet to try an actual key lime pie but if this smoothie is anything to go by, I’ll be looking forward to it. I’m glad your subscription is working again. Thank you! This smoothie looks and sounds delish Katherine!!! I love lime too but don’t use them often enough. Thank you Heather. I’m sure you’ll love it. They are quite expensive here so it can really bump the price of a smoothie up by using them but I love it when they are on a special offer as I buy loads of them. love this recipe, healthy, delicious I’m certain and bright green. I’m so glad I found your blog through BakeYourDay. Thank you Vicki. Yes a lot of my green thickies don’t go bright green because the oats lighten them and I tend to put less greens in my recipes for my website, but I put more greens in my own smoothies. This one did go a lot greener though which I like too. It’s a gorgeous smoothie, I’m sure you’d love it. If you need it to be 100% raw you can always use raw oat groats, use raw buckwheat or just leave out the oats. Hi I’m just about to plant a Tahitian lime tree in my backyard which is in a sub tropical part here in Australia. I’ve never seen Key limes but remember being intrigued when I was younger reading books that mentioned people eating a Key Lime Pie ( must be said with American accent!) and I’d think how yummy does that sound. Going to try this today because I have all the ingredients plus nuts, hemp seed and oats to make the milk. Just as yummy! Hi Jane, wow you’re planting a lime tree. That’s amazing that you have the ability to do that. Fruit is so much better for you when it’s ripe and freshly picked and I bet it tastes amazing too. That’s great you’re giving it a go. I hope you enjoy it. Many thanks for visiting. Hi yes in this area citrus grows really well. There is a small organic mandarin and orange farm just down the road who sell directly to everyone. I’ve also got a lemon tree ready to go, just have to try and dig the holes! I moved up here after living for 20 years in an apartment in Canberra (to the mid northern coast of NSW) so I could have a garden to grow food especially greens, edible weeds and fruit for green smoothies. Love how they can change your life like this! Wow that’s amazing you are planting your own citrus trees. We’d never have enough fruit locally to be able to survive on fruit, we only get a few berries for a couple of months a year. I’ve recently started growing some Scottish Kale for the first time which in theory should grow well here but it’s recently taken a turn for the worst, but I am no expert gardener so it’s going to require some trial and error. That would also be a long term plan for me to be able to grow a lot of my own fruit and greens for smoothies. It is funny isn’t it how they do change you like that, but it’s a good feeling too getting back to nature. By the way I just tried to leave a comment on your blog post but it may have gone to your spam folder (I think that’s happened before when commenting on your blog). Hi the website is being redesigned and about to deactivated then new one will be up so comments might not be working. I can’t write anything there either and my replies aren’t working either. Kale is one of the things I want to grow and have small dinosaur kale plants growing at the moment. I did research on all the different types ( United States of Kale on website) and discovered a Scottish saying was “to be off your kale” if you weren’t feeling well! We call it curly kale and I just made amazing chips with it- yum! I had NEVER heard of kale until green smoothies. Yes definitely trial and error but starting off small, one plant at a time! Jane. Hi Jane, that’s great your website is having a redesign. I want to redesign mine too as I’m never quite happy with it. Ha ha, yes it’s so funny that Scottish saying, but nobody actually eats it here anymore. Yes we call it curly kale too but my seed packet said Scottish Kale so I thought that would grow well. I planted some dinosaur kale too and most of it didn’t grow at all or was eaten but one plant did grow and that’s actually doing better than the curly kale. I think i’ve got about 3 meals out of my greens so far so I don’t know whether it’s worth growing my own food here. I’m going to keep trying though. It’s a fun hobby anyway. Yes I’d never heard of it either until green smoothies and you’re right kale chips are amazing! My husband made this for me last night. I love it. A couple of people at work tried it also,they want the recipe.Great smoothie! That’s great, I’m so glad you all loved it so much. I love it when I find such a good recipe that I just know everyone will adore! Thanks for visiting Green Thickies. Hope to see you again soon. Wonderful sounding smoothie. Thanks for sharing on Southern Sundays! OK, this sounds too good. I have a whole bag of limes sitting in my fridge for awhile now, so this would put them to great use! I will definitely try it tomorrow – maybe with not as many dates – and let you know how it goes. I am drinking this smoothie right now and it is sooooo good I decided to write about it. I just sub the oats for sprouted quinoa and you cannot taste it at all. I also use 4 limes wich gives it that punch of tartness that lingers in your mouth, subtle but still tangy. 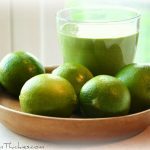 It really tastes like key lime pie but so much better for you! 5 stars! I’m so glad you liked the recipe Linda and it’s interesting to hear that you managed well with adding the quinoa. Thank you so much for letting me know you enjoyed it. Great recipe! I don’t use oats though, do you know the nutritional count without also? I think one cup of oats has around 300 calories and one serving uses half a cup of oats so if you only drink one serving you can take about 150 calories off the total. I hope that helps. Fantastic recipes, can’t wait to try more! I just tried this and agree it is really good. This summer I got into “green thickies” after having a blender sitting without being used since I got it as a house-warming gift seven years ago. They are the perfect “commuter” meal – I make one for breakfast and drink the other at lunch. My bad habit was going all day (from 6:30 to 5:30 p.m.) without eating because I’m so busy at work and don’t take scheduled breaks, and this has really helped. Thank you! Wow that’s great Sarah. I’m so glad it enabled you to have a healthy meal on the go. My husband used to do the same. I’m so glad you liked this recipe, it’s one of my all time favourites! I CANNOT EAT BANANAS SO THANKS FOR TIP OF USING MORE OATS. No problem. It won’t be as sweet but you could use mango or peaches or more dates if you want to sweeten it up.